That’s a little shocking, isn’t it? What was interesting was how Berdych was not only blasting drive backhands down the line, but also mixing in some nice slice backhand approach shots. This is a great idea against Djokovic, who is much better at dealing with attacking shots and low balls on his backhand side. Berdych’s plan was smart, and it was working. So why would a player of Tomas Berdych’s stature abandon such a successful shot? It wasn’t hurting him one bit. Slowly but surely, the Czech No. 1 gradually shed his initial bravado and ideas. 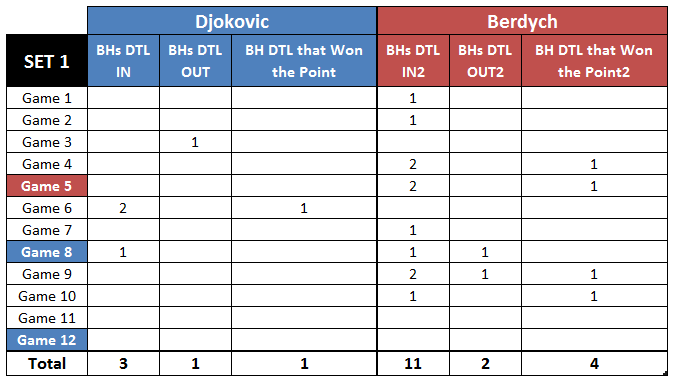 Berdych stopped being a threat to Djokovic, falling back to the familiar dynamics that have lead to the pair’s extremely lopsided head-to-head (in case you don’t know, it’s 13-1 in favor of Djokovic after today’s win). Why did this happen? Notice those middle games of the set. I actually re-watched those, thinking that I had gotten distracted and stopped paying attention to the shot I was supposed to tally. Nope, no dice. Not a single backhand down the line was hit in three straight games. 1) Facing a break point at 4-3, but still up a break, Berdych hit a wonderful backhand down the line and came to net looking to put away Djokovic’s cross court forehand passing shot. Berdych found himself with a makeable volley, but he proceeded to stone it into the net. Such a deflating error gave away his hard-earned break advantage. 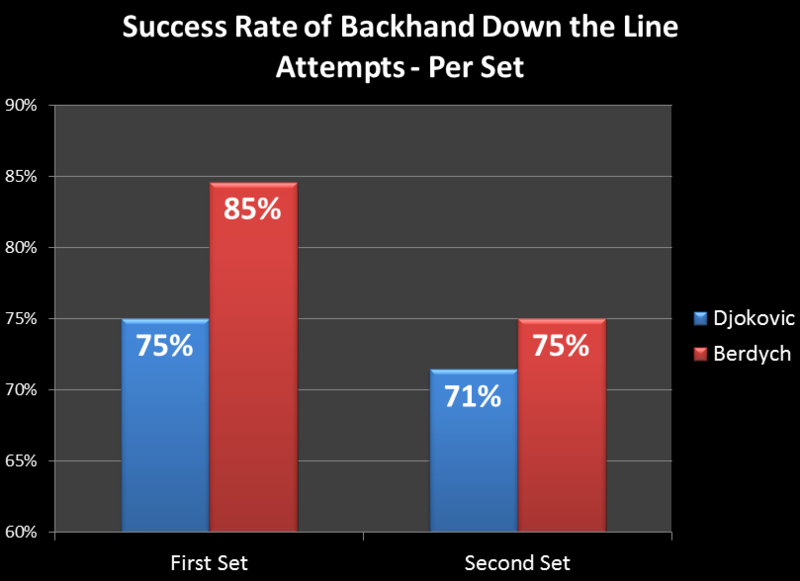 2) Facing set point when serving at 5-6, Lucie Safarova’s ex double faulted. Still, isn’t it amazing how Berdych retreated into his usual tactic-less self after mistakes that didn’t have anything to do with his initial tactical approach? To further this point, Berdych handed Djokovic the decisive break in the second set by badly missing … an overhead smash. To recap, the match was probably decided by a stoned forehand volley, a double fault, and a botched smash. Yet the backhand down the line was the shot that got taken out of the arsenal as soon as things started to look bad. Now, why were Djokovic’s backhand down the line attempts so low in this match? It was quite funny to hear one of the commentators of the match (the one that’s not David Mercer) say something like, “Djokovic gave Berdych a taste of his own medicine there,” in the second game of the second set, as Djokovic unleashed a very successful backhand down the line. That was a weird comment to make, isn’t it? If there’s a player who is famous for his backhand down the line, it’s the World No. 1. Heck, we had just seen it used so well the day before against Del Potro! So why did Djokovic go away from his (allegedly) favorite shot? It has to do with the gameplan Djokovic wanted to implement for this match, along with Berdych’s court position tendencies. In terms of Djokovic’s strategy, it was clear from the start that he wanted this match to be decided by forehands. The World No. 1 surely remembers that while Berdych owns a most powerful forehand, it’s prone to breaking down. Djokovic probably thought that he was going to be able to coax some errors from cross court backhand exchanges, too. 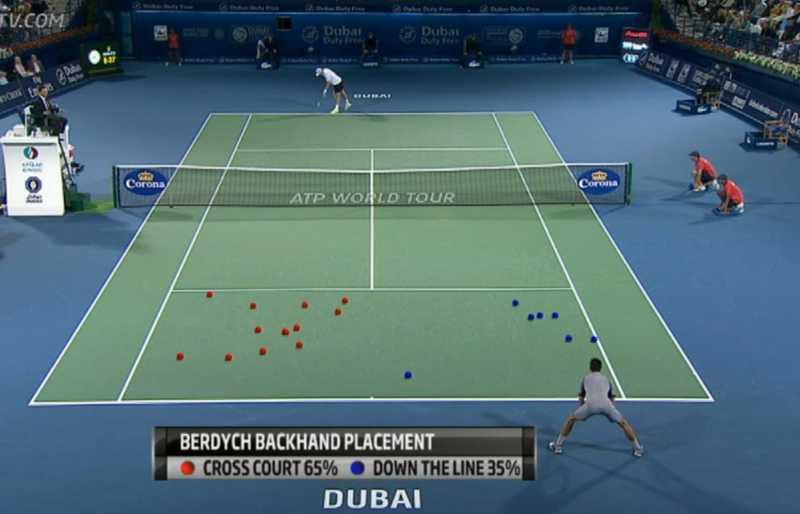 Berych’s court position tendencies also influenced this approach: unlike Del Potro (and Federer), Berdych doesn’t look to camp out on his backhand corner: he likes to gravitate towards the middle of the court. Hence, there’s less space available for Djokovic to target with his backhand down the line. Of course, the other obstacle for Djokovic was Berdych’s (initial) willingness to be aggressive early on during rallies, particularly during cross court backhand exchanges. We know that Djokovic loves to take his time to unload on the backhand down the line: it’s as if he’s thinking “not yet….not yet….NOW!” Djokovic loves to hit that shot within the flow of a rally, not so much at the beginning of one. Berdych, by being the aggressor (take note of this, Juan Martín del Potro) with his own backhand down the line early in rallies, was effectively neutralizing one of Djokovic’s most dangerous weapons. Sadly for Berdych, he seemingly forgot all the good things that were happening to him when he was executing a sound tactical gameplan at the beginning of the match. I guess these are the things that happen when you’re not exactly known for your tactical acumen. Brilliant analysis! Only of Berdych continued his gameplan, God knows who wld have won yest! Or atleast we wld have witnessed an awesome three set match! Thank you, Poorna. I do wonder what would have happened had Berdych been more faithful to his initial tactical approach. Only he knows! Very interesting and well written article…Nicely done. 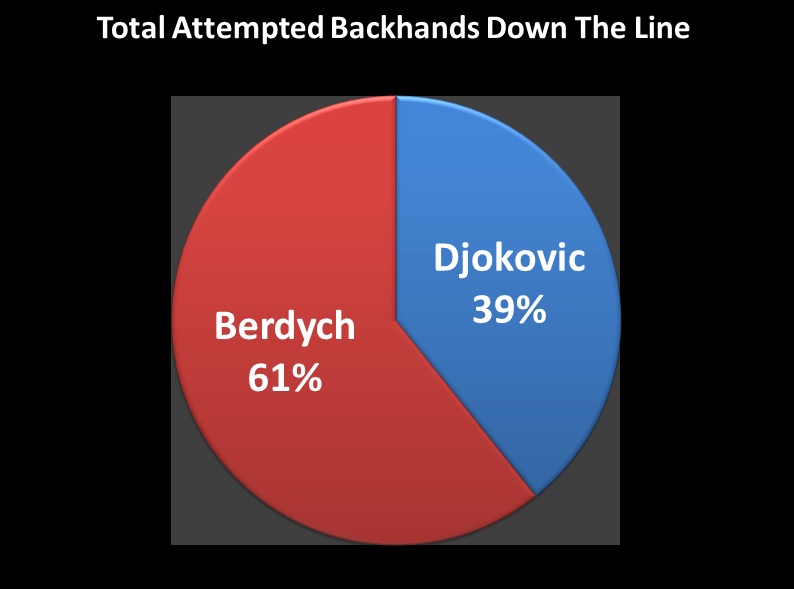 It would be interesting to also know, during the 2nd set, how many backhands were hit by Berdych in general. In other words, those were all oppurtunities for Berdych to hit a BHDTL, but apparently he did not, in most of those instances. I am saying this, because, as you mention, Djokovic probably steered the rallies more towards forehand exchanges, and if so, there were even less Backhands for Berdych to begin with…to be able to try BHDTL. And Djokovic would have been the one steering which way the rallies go in this match, since he has the better ability to change the direction of the ball in general. 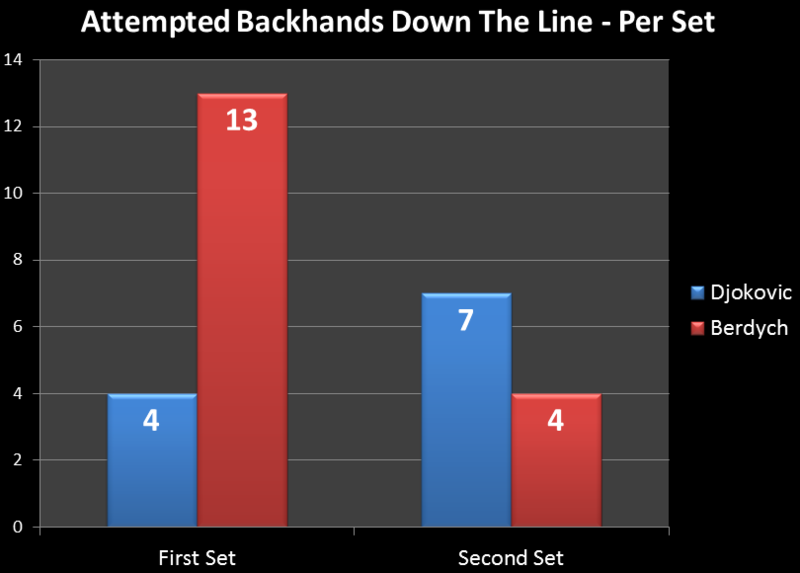 Also interesting would be, out of all those backhand chances that Berdych got in the second part of that match, how many were good for him to hit a BHDTL…and he passed up. This would be a little bit of a judgement call, but I am sure a person with your level of tennis knowledge can do. This, is to determine if Birdman really pulled back from hitting shot that was working for him in later part of the match or Djokovic really ratcheted up the pace of his balls, so it was difficult for birdman to go for that more difficult and risky shot. In other words, birdman didnt pull back, Joker forced him in to retreat. Bcos Joker was struggling a bit in the beginning of this match to find his rhythm and range (…albeit a bit due to surprising aggressive play by birdman), hence his shots may not have been forceful at that time, helping birdych go for BHDTL a bit more easily. But, this is a great lesson for players of all level, to not let some setbacks steer away from your original course. Roddick said after his 16-14 loss in the wimby final to Fed, that one of the things Fed doesnt get enough credit for, is “staying the course” which according to Roddick Federer had done, even after early setbacks in the first set and three quarter (until the point in 2nd set tiebreak when Andy botched the backhand volley). I guess that is the thing that happens when you are well known for your tactical acumen!